*i also found 9 canadian pennies, 2 chuck e. cheese tokens, 1 boston subway token, and a few other assorted pieces of undefinable foreign currency. for a grand total of $93.10. that’s roughly $.25 a day. not bad. which means that cassie– with your guess of $89.50 (the closest without going over), you are the winner! woooooooooooooooooooooooooooooooooooooooooot! good times. p.s. 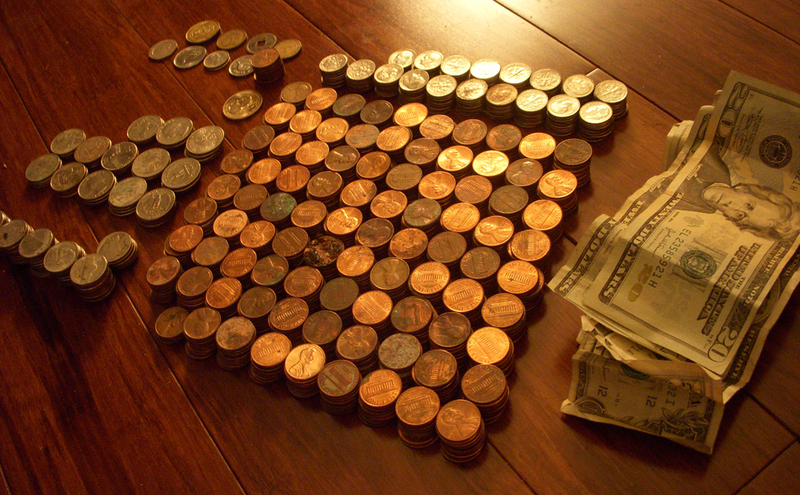 extra props to the boyfriend who counted and cataloged every last penny of it on his day off. Awesome! Thanks! I’m sooo excited! What did the boyfriend get in exchange for the counting? The Chuckie Cheese tokens maybe? he wishes! but maybe if you’re lucky i’ll slip one into the bank. you could be playing so much skeeball and eating so much crappy pizza in the word’s germiest ball pit. awesome. I found a Chuck E. Cheese token on the sidewalk in front of my house once… thought it was kinda weird and would have rather had a quarter! maybe if you took it to a chuck e. cheese in your area you could scalp it outside for $.10. more if the kid is a little slow. and let me just tell you that the really stupid kids hang out at the chuck e. cheese. look for kid with his hand stuck in the claw machine. Wow! So many pennies! Glad I got to witness your penny magic first hand last weekend. You should try Bingo. With your friend Kristina. This is not from your friend Kristina, who is a busy lawyer and does not read blogs at work. i should try bingo. i bet jenny & josh would really like that. too bad kristina’s so busy- otherwise i would invite her too. p.s. who is imogen flowers, and can i dare her to do some pg-13 stuff? xo.